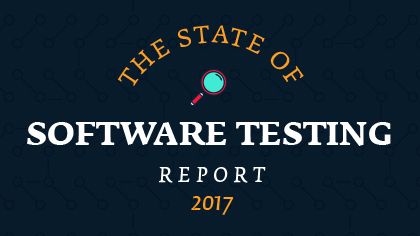 Over 1600 testers have spoken… here’s what they reveal about the state of software testing in 2017. Like we did for a similar report last year, we figured it would be helpful to sum up the info from the report in an infographic for today’s post. If you get a chance, you can read the whole report here. Some interesting shifts were reported in the structure and size of test teams. Notably, less QA teams reported to a VP or Director of QA and more reported to Project Managers. Also, in line with the previous year, test teams are getting smaller, which makes sense as development teams are increasingly adopting Agile. 26% of teams were composed of 6-15 testers while 43% had only 1-5 testers. And that wraps up the most important things you should know from the State of Software Testing Report 2017! Are you surprised by anything? We can’t wait to watch and see what happens as the year goes on, observing which trends come and go. One thing that is for sure, testers will remain in demand, and at Abstracta, we are hiring! If you are an experienced software tester, send us your resume to [email protected]! Excellent Sofia for this Article, this makes more sense on points mentioned in today’s competitive world to live up to the mark of Industry Standards. Cheers. Great and very informative article. Thank you Sofia. Very informative and possibly something that majority of testing community can relate to. Helping the testers to become “technical testers” is an area of struggle, since testing is already under pressure to meet timelines. Carving out time to get acquainted with new skills, training get’s pushed down to meet deadlines. Great Post & creative infographic! Well explained the state of software testing in innovative manner. Muy bueno recibir actualización de las tendencias del segmento del testing. Muchas gracias! Saludos Juan! Me alegro que te haya gustado.